All creatures great and small gather in this colorful jungle city, which doubles as a beautiful sun catcher! 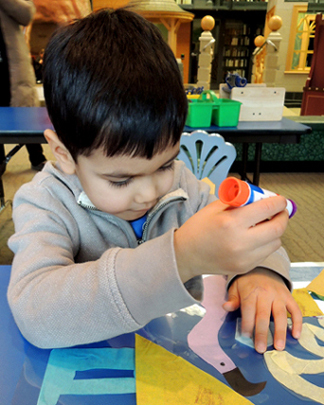 This was such a simple project – clear sheet, tissue paper, glue, and scissors – but it’s been one our patron’s favorite story time projects this year! We read Animal City by Joan Negrescolor (Chronicle, 2018). Nina loves to visit Jungle City and read stories to her animal friends. While each animal has a favorite (the flamingos, for example, like Mythology), the story they like best? The very book you’re reading! This book is absolutely gorgeous, and we tried to capture the artist’s color and shape play with our project. The key to this sun catcher project is the clear plastic sheet. We used 16″ x 20″ archival mylar sheets (one of the perks of being a rare books library!). But you can use thinner clear cellophane wrap, which is sold in the gift wrap section of Michael’s Craft store. Another possibility? Parchment paper, found in the supermarket baking aisle alongside the aluminum foil. It’s opaque, but still lets plenty of light through. 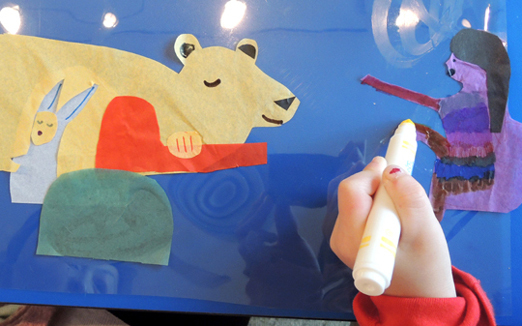 To create your sun catcher, cut, arrange, and glue the tissue shapes to your clear sheet. We purchased pre-cut tissue circles and squares, but also had larger tissue sheets available to customize. We recommend using glue sticks, which allowed for better control and dried perfectly clear (even the purple ones!). 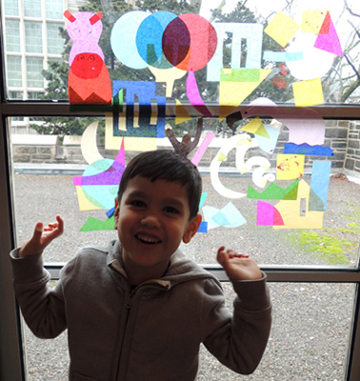 When your creation is complete, tape it to a window or door and admire the shapes and colors. It’s especially cool when the colors overlap! James Herriot fans…today’s blog post title was for you! Animal city, indeed! 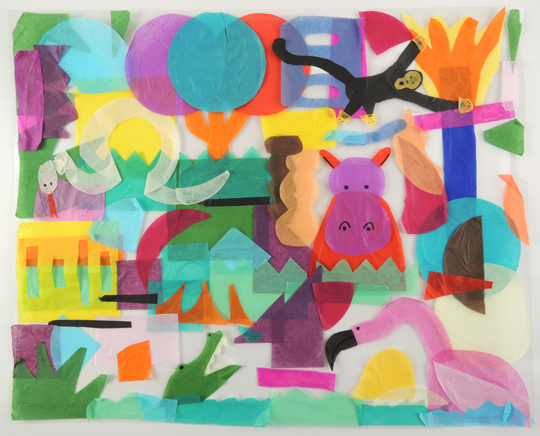 This entry was posted in Picture Book Projects and tagged activity, Animal City, art, children, color, craft, craft project, easy, how to, instructions, Joan Negrescolor, kids, library, light, literacy, program, programs, shapes, story time, story time project, storytime, sun catcher by Dana Sheridan. Bookmark the permalink.